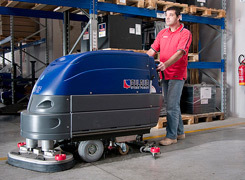 Consolidated Industrial Solutions custom blended floor care products provide solutions to a wide range of warehouse and distribution centers. CIS develops floor care products to clean oils, greases, inks, tire marks, dirt and various soils off your floors. Our floor cleaning products are formulated to work on all types of concrete surfaces (unsealed, sealed, painted, and epoxied) floors. CIS custom blends floor care products for floor scrubbers, mop buckets, and other methods of application. We also customize dispensing systems to lower the cost of the overall chemical consumption which saves your operation time and money. To receive new product information. Please send us your email.